Galaxy astronomy is a hot topic, as many discoveries are appearing. We anticipate the results of the Event Horizon Telesope, which as early as December may reveal the first image of the Sag A supermassive black hole at the center of our Milky Way Galaxy. Recently a second supermassive black hole was discovered in the vicinity of the Sag A black hole. Satellite galaxies near our Milky Way may point to our galaxy being an outlier in its type of galaxies. Fast Radio Bursts (FRB’s) continue to be detected begging questions as well as answers to the structure and cartography of our Milky Way Galaxy. Although we live in the Milky Way Galaxy, we see only a portion of it as the band of starlight across the sky. Our speaker, Loren Anderson, Phd., Associate Professor of Physics & Astronomy West Virginia University , using primarily the Green Bank Telescope and the Aricebo Telescope and the Very Large Telescope Array ( Very Large Array, New Mexico ) studies the structure and properties of the Milky Way. He is locating the most massive star formation regions, “HII regions,” throughout the Milky Way disk, and will talk about progress toward a “complete” census of HII regions in our Galaxy, discussing ongoing work to compare the Milky Way with other similar galaxies. His work is part of HRDS: http://go.nrao.edu/hrds/ and WISE catalog: http://astro.phys.wvu.edu/wise/. A break follows the lecture. AAAP’s October meeting resumes after break with a review of the current and upcoming club activities including and astronomical events. The meeting location is the Science Stage, Carnegie Science Center, 1 Allegheny Ave, Pittsburgh, PA 15212. Take the front entrance of the Science Center under the portico. Look straight ahead for signs to the Science Stage, to the right. The lecture and meeting are free and open to the public. Parking is $5 payable at the parking kiosk in the lobby. There is no charge to attend the meeting or lecture. The public is invited to attend. Please see the AAAP Guide Star Newsletter and the AAAP Facebook Page for additional information. The Saturday, October 7, Wagman Moonrise Star Party starting about 6:55 PM EDT.. Enjoy the views of the Andromeda Galaxy and Double Cluster in Perseus through the telescopes at the Observatory before the Moon rises at 8:30 PM. and much more. The Saturday, September 23, Wagman Star Party starting about 7:15 PM EDT creates an opportunity to view the Moon and the September Sky. Observe theThree Day Old Moon along with the Hercules Cluster, the Ring Nebula and the Andromeda Galaxy and much more. Saturn,Uranus and Neptune will be available for observing. 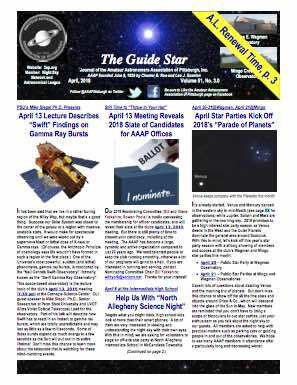 September 8, 2017 Monthly Meeting of the Amateur Astronomers Association of Pittsburgh, Duquesne University, Feature Presentation: Quarks, Strings and Science Outreach for a Better Future by Dr. Patrick Cooper, Phd. The 7:30 PM, September 8, AAAP Monthly Meeting will feature a talk titled: Quarks, Strings and Science Outreach for a Better Future by Dr. Patrick Cooper, Phd. assistant professor of physics, Duquesne University and co-founder of Community Forge . Dr. Cooper’s presentation will delve into his research which discusses the problem of understanding the mathematics behind the strong nuclear force, as well as studying aspects of string theory, potentially relevant to particle physics well below the scale of quantum gravity. After the science chat, he will move on to the important topic of science outreach in Pittsburgh where he will discuss his student’s recent eclipse trip, and current project of building a community center in Wilkinsburg to bring astronomy and science education to underserved communities. Note the meeting will be on the regular night at the regular time but in a different location, the Wolfe Lecture Hall in the Bayer Science Building on the Duquesne University Campus, 600 Forbes Avenue, Pittsburgh, PA 15282. Google map Bayer Hall is next to Mellon Hall on Bluff Street, #17 on campus map. Duquesne University Map After 3PM on Fridays there is No Permit needed to park on campus. After 6PM street parking on campus is free. There is the Forbes Garage, #34 on the map, diagonally across campus, that charges a flat rate of $6. Stay for the business meeting to hear reports with AAAP current activities and plans for more and observing tips for the month from John Holtz. In a Special Report: AAAP’s Jim Surman will give a presentation on the Veteran’s Astronomy Project with the Aspinwall VA Hospital. Come out and see your AAAP friends and make new ones at this opportunity to hear an informative astronomy talk and hear about club activities. We have the room as early as 7PM, so arrive early and have some time to visit with others. The meeting free and open to the public. Updates here and on AAAP’s Facebook Page. Save the Dates: Next AAAP Monthly Meeting is Friday, October 6, 2017, Carnegie Science Center. The Annual Joint AAAP-SSP Meeting is Wednesday, October 11. 2017 at Duquesne University. Note in each of these cases these meetings are occurring a week earlier than usual. https://3ap.org/wp-content/uploads/2018/08/logo_web_2018-300x300.jpg 0 0 DeSantisK https://3ap.org/wp-content/uploads/2018/08/logo_web_2018-300x300.jpg DeSantisK2017-09-01 13:28:342017-09-29 12:34:42September 8, 2017 Monthly Meeting of the Amateur Astronomers Association of Pittsburgh, Duquesne University, Feature Presentation: Quarks, Strings and Science Outreach for a Better Future by Dr. Patrick Cooper, Phd.